Congratulations to the Green Bay Packers on winning Super Bowl XLV. Heck of a run this team went on and it is remarkable considering how close they came to missing out on the playoffs altogether. Congratulations Aaron Rodgers on winning MVP of Super Bowl XLV. As I mentioned earlier in the day he has definitely earned it. Over the next few days you will see plenty of Green Bay Packers Super Bowl merchandise. There obviously was some Steelers stuff printed already and that stuff will now get donated. Speaking of Packers Super Bowl merchandise, here is some of what is already available. According to ESPN only one other game in NFL history has ended 31-25. The Steelers also came out on the losing end of that one way back in 1952. The whirlwind ride for Aaron Rodgers will continue tomorrow night on Letterman and continue later this week when he goes to Disney World. Cowboys Stadium fell 766 people short of setting attendance record for Super Bowl. Them not having all seats built obviously didn’t help matters. Ben Roethlisberger in 3 career Super Bowl appearances has thrown for 3 TDs and a whopping 5 INTs. Only one other game in NFL history ended with a 31-25 final score. The Philadelphia Eagles defeated the Pittsburgh Steelers by that score on September 28, 1952. It was also the first NFL Championship decided by exactly six points since 1958, when the Baltimore Colts defeated the New York Giants, 23-17 in overtime. Aaron Rodgers threw for 304 yards and three touchdowns. He’s the fourth quarterback to throw for at least 300 yards, with at least three touchdowns in a Super Bowl, joining Joe Montana, Steve Young, and Jake Delhomme. The Packers had 13 rushing attempts, tied with the Rams (Super Bowl XXXIV) for fewest by a Super Bowl winner. The Rams and Packers also rank 1-2 in fewest yards rushing by a Super Bowl winner. The Packers 50 yards were 21 more than those Rams. Nick Collins 37-yard interception return for a touchdown made this the third straight Super Bowl (and the seventh in the last 11) in which an interception was returned for a score. The Packers kept alive a historic streak. Teams that return an interception for a touchdown in the Super Bowl are now 11-0. I ended up winning the NFL pick’em challenge. Thanks to all who participated. Here are the overall standings. Will be posting my thoughts through the game here. Missed the opening kickoff as I was still making my pizza run. I’m hearing that Christina Aguilera botched the anthem? Earlier today I took the Packers to win 20-13. Good call by the Packers in deferring to the 2nd half. No sense in throwing out a QB who hasn’t been here before right into the fire. That Doritos/dog commercial was pretty good. That Dodge truck commercial was not. What was Audi trying to do there? Saw that Doritos commercial with the magical powers last night on the NFL Network show. Not bad. Pick 6 from Ben Roethlisberger! Couldn’t happen to a nicer guy. Don’t know about the penalty call though. I know it against the rules but I’m sure the Packers will take it. Friend of the blog Razor said it best. What did that “Reply All” commercial have to do with Bridgestone tires? Nice run from Ben Roethlisberger on that 3rd and long. Much needed field goal for the Steelers there. Definitely will be watching Transformers 3. How do you that your $3 million investment was worth it? Kia Optima, Pepsi Max and Brisk are trending in the worldwide on twitter. Points right there would have been huge for the Packers in response to the Steelers FG. Still well in control though and Rodgers has looked good. Dear Fox, no one cares how good you think Roethlisberger is. When I predicted 20-13 earlier today I clearly meant to say 40-13! I like rooting against Roethlisberger but can we get a close game please? Great drive from the Steelers there. They definitely needed the TD with the Packers getting the ball first in the 2nd half. 21-10 Packers. Here is the botched anthem from earlier. “Empire State of Mind” again? C’mon people. That actually reminds of a brutal thing they did at Rutgers Stadium. “RU State of Mind“. From Fox’s halftime show. No team has won the Super Bowl when being down by more then 10 at the half. Whoa. Charles Woodson out for the game? Steelers were down 18 points earlier in the game. According to sbnation the biggest comeback in Super Bowl history was 10 points. You CAN NOT drop a big play opportunity like that. Figures. Packers miss big play opportunity on last drive and the Steelers come back to score. We have a ballgame. 21-17. According to Trey Wingo of ESPN, no team with a pick 6 has ever lost a Super Bowl. What was Aaron Rodgers doing there? It looked like he had time there. That Groupon commercial was horrendous but that Coke border guards one was fantastic. Great defensive drive for the Packers there. First Matthews get the tip and then the sack. Why is Eminem all over the place today? Yikes, Packers have 17 offensive yards and 30 penalty yards this quarter. Now Driver is out of the game? Great call by Mike Tomlin there forcing the Packers to punt again. Here is the Chrysler “Imported from Detroit” ad starring Eminem. It is 2 minutes long. That NFL commercial with classic TV shows was fantastic but how is Alf a Carolina Panthers fan? How many of those Aaron Rodgers incomplete passes have actually been drops? Big drive for the Packers. Absolutely needed that TD. Random observation from every Super Bowl. Most of these commercials don’t make want to buy these products at all. Really should have got a TD there once Polamalu tripped. I will be really angry if Steelers win by one here. Green Bay Packers win the Super Bowl. Favre haters rejoice! Aaron Rodgers has as many Super Bowl rings as Brett Favre. Now that is fantastic. I’m honestly surprised that Favre has been quiet these 2 weeks. The whirlwind ride for Aaron Rodgers will continue tomorrow night on Letterman after he goes to Disney World. Still think that the Disney World/Disney Land deal is one of the coolest endorsements in sports. Super Bowl XLV is finally here. The Green Bay Packers are a 3 point favorite going in. I have spent some time this morning reading up on stuff from around the 2005 NFL Draft which saw Aaron Rodgers slip all the way to 24th pick. My San Francisco 49ers had the first overall pick in the draft that year and Rodgers was a California kid who was a lifelong 49ers fan. I’ll admit that I wasn’t sold on Rodgers as being a perfect fit for the 49ers but I was against Alex Smith. Long before a NFL team made the mistake of wasting a first round pick on Tim Tebow, the 49ers wasted the #1 overall pick on another Urban Meyer coached QB in Alex Smith. Rodgers was actually the 3rd QB taken (yes, that is a slight reach as Matt Jones wasn’t actually drafted as a QB). People were worried about Rodgers attitude. Looking back at his NFL career that seems almost silly but that Aaron Rodgers deserves a lot of credit for that. Earlier today ESPN played a clip from a Sportscenter interview in 2005 where they were discussing the negative perception about him and people comparing him to Akili Smith and Joey Harrington. Rodgers replied “I am better then those guys.” During his interview with ESPN today he said that was a mistake and that was not him. He went on to add that the 2005 draft was the best thing that happened to him because it humbled him. Todd McShay at the time correctly predicted that going to the Packers would be good for Aaron Rodgers. Unlike No.1 pick Alex Smith at San Francisco, Rodgers will not be under pressure to produce right away. The Packers will not be pressured to get him on the field early. It looks like a good fit for both. One of the four men from the VISA commercials who had been to every Super Bowl will be missing the game. To make matters worse he is a Packers fan. President Obama had said that he would be at the game if the Chicago Bears had made it to the Super Bowl, but he’ll have to settle for a Super Bowl Party at the White House instead. President Obama will give Bill O’Reilly a live interview at 4:45 PM Eastern as part of Fox’s pregame coverage. Kurt Warner seems to agree with me that Ben Roethlisberger is overrated. ESPN is asking if the Steelers are a dynasty. If they do win this game it’d be hard not to label them as one having won three Super Bowls in six years. I seem to be in the minority in labeling the San Antonio Spurs championship teams a dynasty. ESPN.com has a story about Vince Lombardi’s old house in Green Bay and the shrine it has become for football fans. 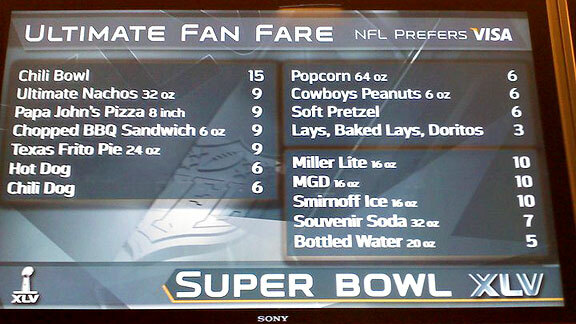 Prices at the concession stands aren’t as bad as I thought they would be. The organizers in Dallas forgot to build some temporary seats that they sold for this game. Oops! Some will be moved elsewhere in the stadium while others will get a refund for 3X the face value. Really looking forward to this game. Two of the most stories franchises in the NFL. We all know that the Steelers are chasing a 7th Super Bowl title but if you go back to the pre Super Bowl era the Packers are going for the 12th championship. I am expecting a low scoring affair but the Packers will pull it out 20-13. By now all football fans are aware that Super Bowl XLVIII will be played outdoors at the New Meadowlands Stadium. There are plenty of critics of a “cold weather Super Bowl” but like I mentioned before, I love the idea. The snowstorm that hit the Northeast this week has given fresh ammunition to those who oppose a Super Bowl in the Northeast. Look around and you will find plenty of columns like this one in today’s New York Times criticizing the NFL. Yes, the NFL did postpone a game this week because of snow but so what? It was the first game NFL has had to postpone on game day because of weather since 1932. If the Super Bowl has to be postponed because of extreme weather it is not a big deal. No one will be hurt by a postponed Super Bowl. People will watch the game no matter when it is on and as mentioned earlier, the likelihood of a postponement is small. The decision to postpone the Eagles/Vikings game was the right one. People like Pennsylvania Governor Ed Rendell are idiots for criticizing the move. The city was under a State of Emergency, why take away law enforcement officials from the streets and bring them to the stadium instead? People will cite this weeks Vikings/Eagles game as a reason why the NFL should move to the Super Bowl but what if the weather is nice? NHL’s Winter Classic in Pittsburgh is in danger because temperatures are expected to be too warm in Pittsburgh. For their part the league is standing by their decision to have a cold weather Super Bowl and rightfully so. Super Bowl XLVIII is coming to the Meadowlands! Great news from the NFL earlier today as the new Meadowlands Stadium won the right to host Super Bowl XLVIII. Chances are that the limited tickets that do open up to the general public will probably cost closer to $1,500 by the time this game is held in February 2014 but I am going to have to figure out one way or the other to actually go to this game. This might be my best chance ever to go to the game living so close to the venue and thus saving on travel expenses. New York/New Jersey beat out Tampa Bay on the 4th ballot. Miami had been eliminated on the 2nd ballot. The 4th ballot was a surprise to me as most of the reports the last few days were hinting at a landslide for the new stadium. I don’t understand the people who live in the NYC/NJ area and oppose this idea. There are people complaining about traffic. How is that different from any other day in this region? There is some event or another always happening in NYC and it blends right in. There is always some convention or another going on and unless you are directly involved with the event do you even notice a difference most of the time? Nope. Weather? Who cares. If it snows it’s even better. Who doesn’t love cold weather football? Heck, it probably means that more real fans will actually get into the stadium. Plus, as this NFL weather report shows, the weather in NYC during Super Bowl weekend has actually been pretty good the last 5 years. This will be a great show and I truly believe that the Super Bowl will return here further down the line as well because I am expecting this to be a huge success. Broadway will put on a show. There will be events at the Madison Square Garden. Jacob Javits Center will host Radio Row and other events. The region is more than capable of putting on a great show. Don’t forget the finances of this as well. The 2014 Super Bowl will be part of the next TV contract negotiations. You don’t think some network will pay a premium for a NY/NJ Super Bowl? Congratulations New Orleans. As I mentioned earlier today for the first time in a decade I wasn’t rooting heavily for one team over the other. A couple of weeks ago there were plenty of people counting this team out yet again after their late season slump. It was so hard to root against this team given what this they’ve been through in the post Katrina rebuilding process during these past 4.5 years. Their stadium was used to hold refugees trying to escape the carnage. Their stadium faced major damage and for a year they played all 16 games on the road. There were plenty of discussions about whether this team should be moved out of New Orleans. After all the city was destroyed. There was financial hardship everywhere. Football should have been way down on people’s priorities right? Wrong. This city loves their Saints. It was great to see the NFL and the Saints show love to this city. We talk all the time about what is wrong in the world of sports, this has been a great example of how sports can be great. What Super Bowl Ads should I go back and watch? Had the volume down for most of the game. With 30 people here it was loud. From what I caught, the human bridge looked pretty good. The Letterman/Oprah sequel starring Jay Leno seemed good too. What else? The commercials are all up on Hulu by the way. I can’t even begin to imagine what the party is like in New Orleans right now. A lot of schools have already cancelled classes for tomorrow and most businesses will probably see workers call out. There is no need to make up an excuse about being sick. Your boss will understand! The pictures above are courtesy of my sister’s blog. How many of these Reebok New Orleans Saints Super Bowl XLIV Champions Locker Room Hats do you think Amazon and others will sell tonight? Same goes for the New Orleans Saints Super Bowl XLIV Champions Reebok Official Locker Room T-Shirt . Have to say these look pretty good. These Locker Room Hats/Shirts are usually pretty ugly in all sports. Soak it in Saints fan and buy. It’s not every day that your team wins. So whether it is the hat or shirt (what I prefer to buy) or Blu-ray or DVD . Enjoy it. I’ve had a rough run with my teams. The Leafs haven’t won since 1967. The Angels haven’t won since 2002. The Raptors still haven’t won one. The 49ers haven’t won it sine 1994. I’ll post an entry some time in the next couple of days on the Giants win from a couple of years ago. Have some great stories related to that as I worked for a sporting goods store at the time. By the way, any Giants fans out there want a Giants Super Bowl hat? I have a few new ones still sitting around. If you don’t know they obviously have some Colts merchandise printed to for local stores and the stadium itself. That stuff is on its way to Haiti tonight. Just look at the crazy amount of stuff available for purchase already. Winning a championship sure is one hell of a stimulus to the local economy! I know everyone and their mother likes to make a Super Bowl prediction but former FEMA Director Michael “Brownie” Brown should have probably kept his pick to himself. Yes folks, the man who was widely criticized for his horrible mismanagement of FEMA in the aftermath of Hurricane Katrina has picked the Indianapolis Colts to win this year’s Super Bowl. In the immortal of words of George W. Bush….”Hecukva job Brownie!” As @dukestjournal mentioned on twitter Michael Brown did work with Colts in his old gig!